This is Madam Griselda Blackwood, and she is a very wicked witch! 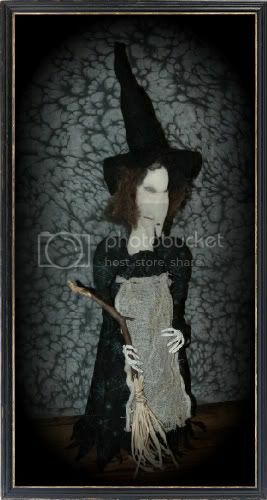 Madam Griselda Blackwood was made from aged muslin, lightly painted and aged to give her an old and worn old hag appearance. She has the face of a wicked old witch, don�t you think? Notice the hairy wart on her nose. And check out those hands! Madam Griselda Blackwood has shades of real sheep�s wool hair in shades of brown, all hand stitched to her head. She wears a black felt hat that has also been hand stitched to her head to stay in place. Madam Griselda Blackwood is dressed in a black cotton print dress with images of spiders and spider webs, with long puffy sleeves and a jagged edge to the bottom hem. She also wears a dirty cheesecloth apron. In her hands, she holds her broom. Have you ever seen a witch without a broom? Her broom was made from a real stick and raffia secured with rusty wire. Madam Griselda Blackwood is made to hang, but she can also stand in place, as she is weighted, as long as she is standing on top of something, so her dress can hang down. A soup can works great. Special thanks to Soft in the Head for the pattern design. Madam Griselda Blackwood stands 19� tall to the top of her head and 25� to the top of her hat. 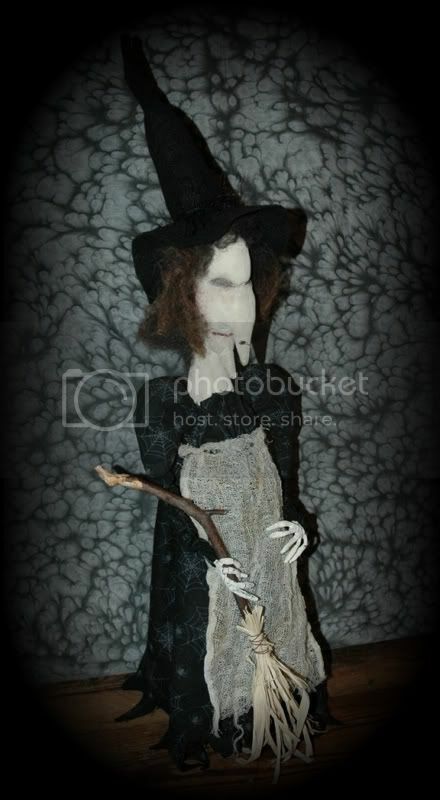 Madam Griselda Blackwood will surely bring lots of spook and fright to your All Hallow�s Eve. She will arrive signed and dated.